There has been talk of a backlash against Robert Parker's palate for quite a while now, and it seems to be slowly making its way into the mainstream. The famous wine critic began developing a taste for very big and jammy, over-ripe wines in the 1990s, scoring them in the high 90s, while many outstanding traditional wines of more elegant complexity that had once been the age-worthy wines of choice waned and struggled to break the 90 point barrier. A December 2000 in-depth article on Parker in The Atlantic called him the most influential critic in the world, in any field. His influence was so great that his high scoring wines rose to super-stardom, while low scoring wines wouldn't sell at all. As a result many wineries started making wines tailored to Parker's palate, letting their grapes hang on the vine for weeks or months longer, concentrating the sugars to create massive fruitbombs in order to gain higher ratings in hopes of selling more wine. This came to be known as the "Parker Effect", or the Parkerization of wine, and is now mostly referred to in pejorative terms. Parker's former assistant Elin McCoy wrote an excellent piece for The World of Fine Wine in 2010 titled Twilight of the Emperor: The Waning Power of Robert Parker which outlined many of the nuanced effects of Parker's power explaining the backlash and his declining influence. Napa Valley's Screaming Eagle, the picture of Robert Parker's influence. A major problem with the style of winemaking that the Parkerization brought about is that it masks terroir. When you harvest over-ripe grapes that create super jammy wines with high alcohol, both jam and booze become the main profile of the wine, hiding the earthy complexities or minerality that may be inherent in the vineyard site. These wines then often need to be aged in lots of new oak to add different flavours and nuances, but are distinctively barrel notes, not terroir notes. As immediately appealing as these rich, mouth-filling wines can often be, they inherently lack complexity and nuances that make fine wine interesting. As championed by Robert Parker, for a while this style came to be what people wanted: a new breed of high-octane wines that over-delivered a big flavour profile unlike anything before. But most of these wines all started to taste the same. Cabernet Sauvignons from California became nearly indistinguishable from Australian Cabs, big Argentinean Malbecs or Super Tuscans. This result of the Parker Effect created a homogenization in wine globally. When so many big wines from all different parts of the world essentially taste like boozy jam it defeats the regionally nuanced purpose of terroir that makes wine interesting. This snippit is a great case study in how contextual the perception of wine quality is, as we see this same story everywhere. Its why so many wineries changed their styles of winemaking. Luckily people like Jim stayed true to their craft and continued making traditional wines and now they're coming back into vogue. In the same article Steve Kistler, of Sonoma's infamous Kistler Winery refers to his own former big winemaking style as "blowzy and overblown", signalling a sure change in tide. Likely tired of homogenous jammy wines, many sommeliers are again looking for the lower alcohol, terroir driven wines that aren't heavily doused in oak and represent the terroir of a place, not the style of one man's palate. A little closer to home we see the same return happening in the rising popularity of wineries like Tawse, Thomas Bachelder and Norman Hardie who all have a very traditional French inspiration. Tawse Winery owner Moray Tawse actually produces several labels from Burgundy in partnership with Pascal Marchand and makes very similar wines at home in Niagara. Several of which were perceived to be the Burgundian wines in a mixed blind lineup of French and Niagara Chardonnays by The Burghound, Allan Meadows. Similarly Thomas Bachelder, the famous winemaker from Le Clos Jordanne, is now doing his own pan-continental Chardonnay project between Burgundy, Niagara and Oregon--which I wrote about in an earlier post. And recently Zoltan Szabo published an article on Stormin Norman Hardie in Good Food Revolution in praise of his understated, extremely elegant wines which are low in alcohol, but still very ripe and high in flavour. A testament to legit old-world winemaking that is making these guys superstars amongst sommeliers and restauranteurs. All of this coupled with the recent news that Robert Parker sold his controlling shares of The Wine Advocate to Singapore investors and abdicated his role as Editor-in-Cheif to Lisa Perrotti-Brown, I think its safe to say the end of over-blown high-octane wines dominating the wine market is on its way. If you don't live in Ottawa then you may not know we're in the middle of a deep freeze. I wouldn't say unseasonable, as it can regularly get to -30C (plus windchill -46! ), but in the past few years this has been a little less common. Its the time of year that wine bottles explode in cars and breezeways over night, and restaurants are taking their breaks after a busy holiday season. For this reason it's been a good month since my last blog post. Its cold as hell and there hasn't been a lot going on of interest, so between heading back to the family farm for Christmas, doing some hunting, having a few dinners out, and plenty of wine evenings with friends, the Ottawa deep freeze is decidedly good for 2 things: winter sports and wine drinking. So I thought a little post about deep-freeze down-time wine-appreciation in the Great White North might be an apropos way to kick of 2013 on Capital Wine. Here's a few shots of the good times that bridged 2012 and 13. A Saturday night lineup of top Canadian reds more exciting than the return of NHL hockey -- Tawse Gamay, Organized Crime Cab Franc, Laughing Stock 'Portfolio', Tawse Meritage, Redstone Cab Sauv. A humble collection of Christmas Eve wine. Washington State Syrah and large brontosaurus rib. Trapshooting, the other outdoor activity besides -20c 10k runs. Mulled wine is much preferred to Eggnog. NYE dinner: Mushroom and Gorgonzola spelt pizza with 2003 Montepaone. Dirty wines for a night of dirty cheese and oysters. Jura and Prince Edward County certainly fit the bill. A palpable love for Bordeaux. Half price wine night at Enoteca Ascari in Toronto clearly means Domaine Weinbach for everyone! Bordeaux produces some of the absolute greatest wines known to man, but in recent years many of these have become less accessible due to the rising demand and cost of these prestigious wines. The top wines from Bordeaux have always been justifiably expensive but in the last 10-20 years after the move to enprimeur sales and having become a Veblen Good in the Asian markets, it has been more difficult to get your hands on the top wines. More to the point is the difficulty of getting aged Bordeaux that is ready to drink now. With the enprimeur futures system you need to purchase the top Classed Growth Bordeaux wines site unseen while they are still in barrel because the demand for them is so high that they often sell out before bottling. Couple this with the fact that when supply is fixed and demand rises, so do prices. Therefore many people are in the position of not necessarily wanting to spend increasingly vast amounts of money on wine they won't be able to drink for 10-20 years. As these bottles find their way onto the auction blocks at Sotheby's or Christie's in New York and Chicago they continue to demand unpredictably large sums. If purchasing is done strictly for investment this isn't a problem as values seem to continue rising, but it is quite a ticket for wines you won't be drinking for at least a decade. Luckily we work with Companie Medocaine, one of the finest negotiant houses in Bordeaux and they have released to us an inventory of their Grand Crus, with selections back into the last 3 decades. This is an excellent opportunity to get your hands on some of Bordeaux's most exclusive wines that are close to being ready to drink without an auction house bidding war. The Chateaus we have on offer include Chateau Margaux, Mouton-Rothschild, Lafite, Haut Brion, Latour, Cheval Blanc, Pichon de Longueville (Baron and Comtesse), Lynch-Bages, Petit-Villages, Angelus, Cos d'Estournel, Montrose, Suduiraut and Yquem...to name a few of the superstars. But something that gets lost in the shadow of these outstanding Grand Cru wines is the plethora of great Chateaus that were not Classified in 1855 and make incredible, age-worthy wine for a fraction of the cost. Moreover, many of these wineries are owned by the same families who own the top classified Growths and produce very high quality second wines under a different label: Château Les Ormes-de-Pez is owned by the Cazes family who own Château Lynch-Bages; La Fleur de Boüard is owned by Hubert de Boüard de Laforest, the co-owner of Château Angélus; and Chateau Pibran is owned by AXA Millésimes under the direction of Christian Seely along with top Chateaus like Pichon-Longueville Baron and Petit-Villages, and the list goes on. These secondary wines can be 1/10 of the price of their bigger brothers, and are worth every reasonable penny. But because of all the press the First Growths get along with their prohibitive prices, we can often forget how much incredible wine Bordeaux actually produces outside of the top 10 or 20 Chateaus. On offer is a long list of various vintages from a mix of the First Growths mentioned as well as many great value houses. For more details and the complete offer please request a price list via the 'By Request' page above. I filmed this tasting with Paul Pontallier, General Director of Chateau Margaux at Lifford Wine Agency's office in 2010 for my old blog Behind The Wine. It has some great Q&A insights of the inner workings of one of Bordeaux's most famous Chateaus. Earlier this week I was fortunate enough to join Thomas Bachelder and his wife Mary Delaney for dinner in Ottawa at Steve Beckta's new joint, Gezellig. They had just finished of day of restaurant visits with my colleague Vanessa Nisbet showing off their new releases to the city's sommeliers when we met for what turned out to be an excellent dinner. Thomas in the vineyard in Beaune, Burgundy. For those of you who don't know the name Thomas Bachelder, he's the man who brought fame to Niagara's Le Clos Jordanne as a top Ontario producer specializing in Chardonnay and Pinot Noir. A couple years ago Thomas decided to leave Le Clos to start his own boutique pan-continental Chardonnay brand; a really interesting terroir project making organic Chardonnay in Oregon, Niagara and Burgundy, letting each place and vintage speak for itself. Throughout his past years as the winemaker at Lemelson Vineyards in Oregon followed by launching Vincor's flagship brand 'Le Clos Jordanne' in Niagara, Thomas has built quite a Rolodex of top winemakers and grapegrowers. This is incredibly important to the quality aspect of such an international boutique brand, because if you're not in the vineyard on a day-to-day basis, you better know the best people who are. And he does. Thomas and his wife Mary have used these relationships to rent space inside local wineries and to source all of the very best organically grown grapes, which can be difficult to procure for an outsider. So by making use of all his own winemaking experience as well as great contacts and resources in Niagara, Oregon and Burgundy he's been able to start what looks to be a very very promising venture. Thomas Bachelder and Mary Delaney: Partners in life and the winery. We began dinner at Gezellig with a blind tasting for myself and Grayson McDiarmid, Wine Director at Gezellig. The wine was white, so one would assume Chardonnay considering Thomas' gig. But the colour wasn't dark enough and the nose wasn't quite rich enough to be Chardonnay from any of the three regions they produce in. Chablis crossed my mind, but the palate wasn't quite plump enough either. It was fresh, quite complex, had a lot of depth and minerality, but didn't have the fattness of Chardonnay but definitely smelt like it could be Burgundian. Half jokingly I guessed Aligote, and Grayson agreed. Surprised by our guess, Thomas then asked "...Aligote from where?" - "Burgundy?" we responded. Puligny-Montrachet was the more specific answer! To get some of the top organic Chardonnay grapes Thomas was trying to buy, he needed to buy some Aligote as well. This is often the case with grape growers, to get X parcel of amazing grapes you also need to buy Y. And in this case, whats cooler than Chardonnay's little brother from Puligny?? In Burgundy the vignerons drink Aligote in the fields (their version of Beer O'clock, I suppose), as aperitifs or as starters with oysters--As pictured below in its most legitimate form: in magnum at Joe Beef in Montreal. Thats right, magnums of Aligote...That's how Joe Beef rolls. But if you think the Aligote is cool, that's just the sideshow. Thomas' stable of Chardonnays are an inspiring exercise in terroir. I joined them for a tasting at the Wellington Gastropub the following day to taste through the entire lineup: Niagara VQA, then single vineyard versions of Wismer and Saunders Vineyards in Niagara. The difference in these 3 Chards was clear, but also very interesting similarities when tasted side-by-side. Then when you line them up next to Oregon then Beaune the contrasts and similarities were drawn out even further. I think right off the bat Oregon was my preference as it seems the most middle of the road to me, but Beaune had such a linear acidity with almost salty minerality I kept going back to it. The Niagara wines were surely the richest, but with subtle and balanced oak integration...definitely some of the best that I've tasted recently from the area. A few Wednesdays ago came the exciting conclusion to all the trash-talk that built up around Dimitri Van Kampen's challenge of Wine VS Beer pairings. Dimitri, the owner of Spearhead Brewing, had publicly challenged me and wine to do battle against him and beer over a three course dinner prepared by Chef Michael Farber at Farbs Kitchen and Wine Bar. In the end the pairings spoke for themselves and I'm happy to report that wine won with a sweeping victory over beer in all three courses! It was a fun and fantastic dinner for a sold out crowd of 45 foodies and industry folk. Here is a quick rundown of the dishes and pairings with a few pictures. The first course was trio of tartare: Salmon Gravlax with dill creme fraiche; roasted and pickled beets with goat cheese; and Scallop Ceviche. For this Dimitri brought his Hawaiian-style pale ale, which I thought had all the right flavours for the dish, but was far too powerful for the delicate seafood, beets and cheese. And because my honour was on the line and I was allowed to use any wine in the world, I had to bring my A Game. I chose a rare Chateauneuf du Pape Blanc from Domaine DeNalys, its a blend of predominantly Grenache blanc with Clairette, Bourboulenc, Roussanne, Picpoul and Picardan. Everyone is familar with Chateauneuf Red, but many don't even know Chateauneuf produces White which accounts for only 4% of the region's production. This rare Blanc a blowout; the complexity complimented all the eccentricities of this course and the votes went largely to the wine for dish #1. The second course was a much tighter race. With Chef Farber's roast Lamb shank and vegetables with jus, Spearhead's Moroccan Spice Dark Ale paired really quite well. Frankly, I had a moment of brief nervousness and second-guessing when I tasted the dish with his beer, but luckily I brought one of the New World's most renowned Pinot Noirs: Kooyong Estate from Mornington Peninsula in Australia. While it may have been a touch light for the lamb, the high acidity, rich fruit, and dirty earthy flavours of the Pinot Noir matched really well with the same gamey flavours of the lamb and narrowly defeated Dimitri's nearly perfect beer pairing. Round two chalked up to wine. Dish three was an Apple tartin with a caramel bacon glaze. I already often pair deserts with beer instead of wine, so this was a great opportunity for Dimitiri to win the hearts and minds of the audience as well. And Dimitri brought a fantastic desert beer...but unfortunately it was an Imperial Stout, the 'Choklat' from New York's Southern Tier Brewery. An outstanding beer in its own right and an ultimate pairing for a chocolate desert, but the 10% alcohol intense chocolatey flavour overpowered the more delicate apple fruit desert. I chose to play on the fruitier side of this dish with the 'Ancestral' from Hinterland Wine Co. in Prince Edward County. This 7% alcohol, sweet pink sparkling wine is made from 100% Gamay and was a great match playing on the similar fruit notes, crisp acidity matching that of the apples with the perfect amount of residual sugar in the wine for the caramel glaze. Had his beer pairing been something like Wapoos County Cider or Fruli fruit beer I might have been in trouble. But round three went to wine for the sweep! Looking back on all this, Dimitri didn't really have much to lose as beer was the underdog in this scenario anyway. So by challenging me with all the trash-talk building up to the event he was able to create a platform to showcase how well beer can work with meals in a finer dining setting with an industry and foodie audience as judge and jury. Luckily for me I do these dinners regularly and have one of the best portfolios of wine in the country to draw from, so most would expect wine to win, but that also meant I had the most to lose. So overall Dimitri won too, because even though he didn't get the majority of votes on any of the courses, one came very close and the others had many votes in favour of beer. I'm sure he changed many minds that thought food pairing was left to wine alone, and that was likely his biggest goal of the night: to show beers legitimacy in dining. If he had upset wine and won the challenge that would have just been a bonus. Kudos Dimitri, well played sir. This year's opening dinner for the Ottawa Wine and Food Festival featured famed Montreal Chef and cookbook author Martin Picard from Au Pied du Cochon and The Sugar Shack. The dinner was for roughly 400 guests, held at an unlikely location in Little Italy that was kept secret until only a few days before the event. As lovely as the Sala San Marco on Preston Street is, the Italian banquet hall is quite a departure from The Sugar Shack. But in needing to expedite food to 400 people at once, this was a great venue to make it happen. In planning for the event Martin insisted that his food be served only with Norman Hardie's wines. Norm's wines are such a perfect pairing with Martin's food as they both share an earthy/gamey/unfiltered/dirty/natural/raw essence. So Norm and I swung by the event to help out behind the scenes in the kitchen and chat about his County Pinot Noir and Niagara Chardonnay that were being featured. It turned out there wasn't much help required in the kitchen as Martin brought 10 of his cooks from Montreal who looked like nothing short of a well oiled machine. All the reports I heard from the dining room accounted for the impressiveness of their food and the timing of service. 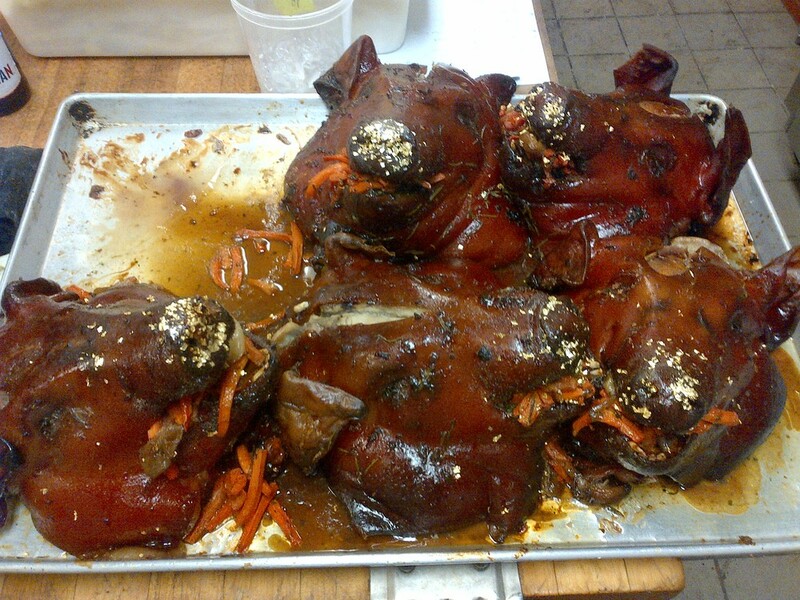 Nothing was cold and everything was cooked perfectly...its not easy to do smoked pig's heads for 400 people at once! After the dinner the crew moved on to Oz Cafe to taste Jamie's Gold Medal Plates winning Yak and crush a few beers. All in all a great night with an excellent group from Montreal. A dinner definitely worth $125/per person dining family-style with wine included. If you haven't been yet, definitely visit Martin's restaurants next time you're in Montreal, but be sure to book in advance...they're as popular there as they were in Ottawa! Martin also has a pretty great TV show on the Food Network called The Wild Chef featuring his journeys across Quebec exploring the cuisine and showing how he does what he does. Back in early September Chef Michael Farber and I were at Brothers discussing Wittgenstein over a game of Backgammon when our mutual friend Dimitri van Kampen, the owner of Spearhead Brewing Co. arrived. He was overcome with a spell of liquid courage and threw down his gauntlet publicly challenging me to a duel--a wine vs beer pairing "throw-down". As a gentleman whose honour was offended, I demanded satisfaction and accepted the challenge. Chef Farber graciously offered his restaurant as a venue and to prepare for us a three course meal to facilitate the duel. I usually prefer to remain the strong silent type but Dimitri's agressive trash-talk began immediately in September. So with less than a week to go, the time has come to put out the fine china and set the record straight. Dimitri, pictured left rocking out with a much less interested man, thinks I'm intimidated by his challenge; but he shouldn't mistake my kindness for weakness. I admire his enthusiasm but he flatters himself. Having done wine dinners with Michelin-starred chefs and some of the world's top winemakers has more than prepared me for a duel with Dimitri. Spearhead burst onto the Ontario craft beer scene in 2011 with their popular Hawaiian-style Pale Ale known for its high alcohol, big hops, and pineapple fruit flavour. A year later they're back with a seasonal second beer temporarily in the arsenal--a Moroccan-style Pale Ale made with dates, figs and raisins which features more than a dash of cinnamon and sugar. Now Dimitri seems to be targeting the more delicate cuisine of the fine dining market with his high octane beers and is challenging me to make his case. So the terms were set for Michael Farber to independently develop a seasonal three course menu for the duel. Dimitri would pair his two beers along with a 3rd wild card beer of his choosing, and I would pick any three wines for my pairings. Neither of us will have had the opportunity to taste the menu beforehand, we only have a list of ingredients to base our pairings. We will be presenting our choices between each course to provide some context to support our pairings. For his sake I hope there is pineapple on the menu. Godspeed. The menu is set and the game is on for Wednesday, November 21st, 7:00pm at Farb's Kitchen & Wine Bar, 18 Beechwood Ave, Ottawa. Tickets are $60 plus taxes and gratuity, wine and beer pairings are included. It is a blind tasting menu, so we can't tell you whats in it, or what we're pairing. But you can rest assured that Farber's food will be tops and that I will be bringing some outstanding wines to do battle with Dimitri's beer. Note: It is not a vegetarian dinner and you will be expected to vote by secret ballot on your favourite pairings. So overall a great night of food, wine, beer and entertainment. We're looking at only 1 seating of 40 people tops. So please reserve your seats immediately. You can call the restaurant directly at 613-744-6509. There was almost unanimous consensus in the Okanagan that my one must-visit for lunch was Meat and Bread at Hastings and Cambie. What a cool spot! Guys, somebody please open one of these in Ottawa! I had their Fraser Valley Veal sandwich and a Phillips Brewery 'Blue Buck' beer (which aesthetically could be the official beer of Capital Wine). Next it was onto Salt Tasting Room on Blood Alley, an unlikely back alley just north of Hastings. I'd heard about this place for years, but never been. Minimalist cement, wood and metal design...couldn't be more my style. I had a great flight of BC wines that I wasn't able to try while in the Valley, perfectly paired with a mix of preserves, cheese and charcuterie. And turns out that seemingly shady Blood Alley is actually home to quite a cluster of great restaurants--I also popped by the elegant Boneta wine bar for an app and drink and went around the corner for a few cocktails from the passionate bartenders at L'Abattoir. All a stones throw from Salt...Great little area. It was unfortunate that I only stopped by for drinks at Hawksworth in the Georgia hotel, this may have been the overall highlight had I spent some more time there. The service, design and wine list were tops. And I'd be lying if I said I wasn't a little in love with their logo (similar black and white minimalism to Capital Wine?). The bottle of Little Farm Riesling we drank in the lounge was one of my favourite Rieslings I tried on the entire trip, and our server was an alumnus of Restaurant 18 here in Ottawa...so many good things happening there. It will be the top of my list to revisit on my next trip out west. A visit to YEW inside the Four Seasons involved a few more Phillips Blue Buck Ales and a surf and turf charcuterie board that was outstanding. 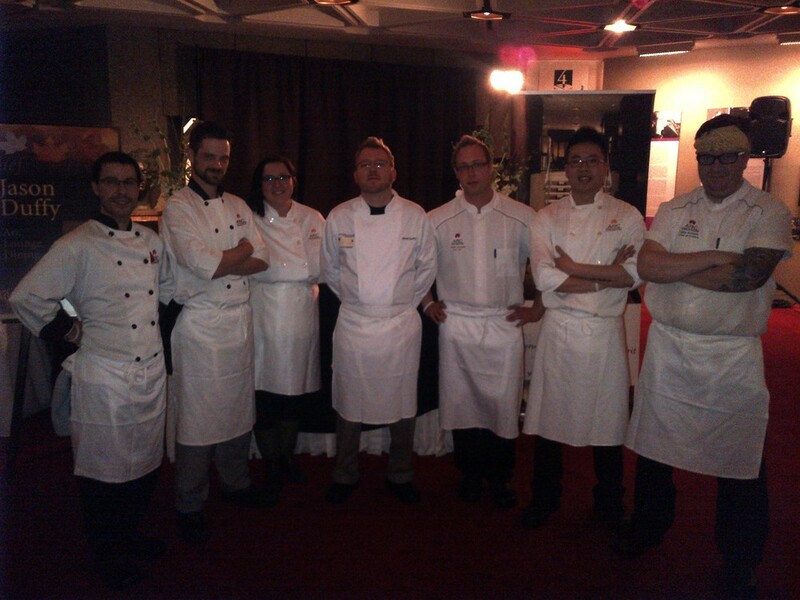 It was nice to meet the affable Executive Chef Ned Bell, turns out he has a lot of Ottawa homeboys as well. It was becoming clear to me that Vancouver does hotel restaurants and bars really really well! While Meat and Bread, Salt and Hawksworth may have been my favourite stops from a list of 10 restaurants in 24 hours, very honourable mentions also go to Chambar, Wild Rice and Catch 122. Everything was really impressive and all within the Gastown area walking distance from my hotel. I'm a big fan of Vancouver again! For those who haven't been, Gold Medal Plates is a national fundraising event held in major cities across the country in support of our Olympic athletes. The premise is a food and wine pairing competition whereby the 8 invited Chefs partner with a Canadian winery to make one ultimate dish. It is judged by each city's top food and wine critics for a gold, silver and bronze medal and the winner from each city moves onto the national culinary competition. This has come to be my favourite event of the year in the national capital region not only because it involves Ottawa's top restaurants and great local wineries, but because in a former life I used to live in Victoria and row for the National Team before getting into the wine industry. So this cause is dear to me because I know how underfunded many of our athletes can be making ends meet while competing at the highest levels. For the past 3 years I've partnered with a different restaurant in the competition as a representative of one of our Canadian wineries. 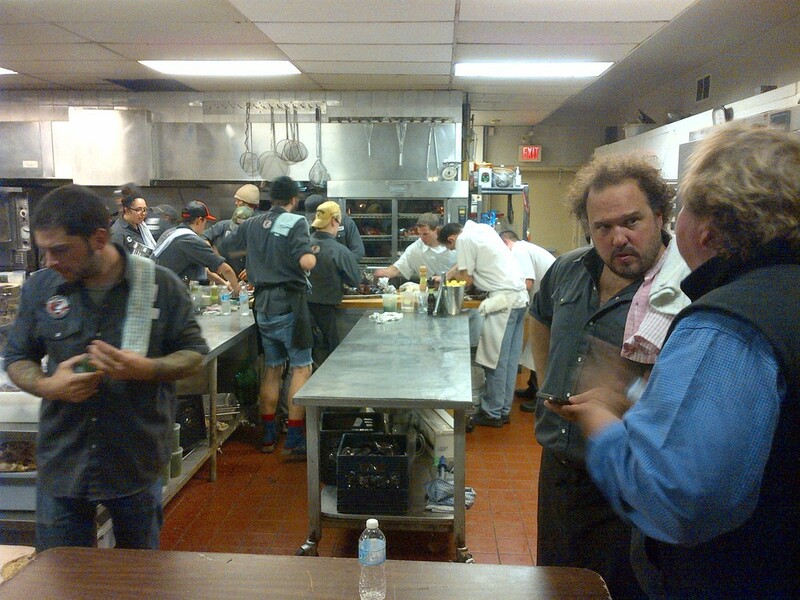 This year Norman Hardie and I partnered with Chef Jason Duffy of ARC the Hotel. Jason's dish featured BC Ling Cod with mushroom cakes and slices of cured, smoked, rolled, and roasted porchetta. It was seasoned with pickled cherries and fennel pollen dust. Chef Duffy and I paired this with Norman Hardie's 2010 County Pinot Noir. The idea was to play on the smokey, salty, earthy notes of the Ling Cod, mushrooms and smoked porchetta with the similarly dirty, earthy notes in Norm's Unfiltered Prince Edward County Pinot Noir. The connecting cherry notes, fresh acidity and funky earthiness was a great combo that ended up taking the Silver medal! Aside from the main pairing competition, the judges also have a competition for just the wines themselves, and Norm's Pinot Noir won the Gold Medal for best wine in show! This was also a small personal victory for me, as last year I partnered with Chef Matthew Carmichael at Sidedoor restaurant pairing his Lobster Tacos with Painted Rock's 2010 Chardonnay, and that wine took the Gold medal for best in show as well! Chef Duffy reveling in his Silver medal! The legendary silent wine auction that accompanies the event. The evening's entertainment: Sarah Harmer, Ed Robertson, Sam Roberts and Alan Doyle all on stage at once! Painted Rock's Estate Vineyard from across Skaha Lake. My final chapter as a stagiaire in the Okanagan was three days at Painted Rock Winery on Skaha Lake, just south of Penticton. With their vines planted in 2005, now onto only their 5th vintage, Painted Rock has amassed an incredible amount of awards and respect for such a young winery...but their youth doesn't seem to affect the accolades. Every winery has something that is their thing, the physical or immaterial things stand out the most about it: whether its the people, the tradition, the innovation, or even fancy tasting rooms that make it special. At Painted Rock that thing is definitely the vineyard itself. It's hard to convey in words how epic this piece of property is...but in these pictures you can start to get an impression. Notice in the above picture how the vineyard is housed within a rock amphitheater created by the Skaha Bluffs in the background. This coupled with the vineyard sloping down toward Skaha Lake helps create a wonderfully unique microclimate that retains heat within the rock of the bluffs and uses the sun's reflection from the lake onto the vineyard to produce really ripe yet astonishingly elegant Bordeaux and Rhone varietals. Having known owner John Skinner for several years now from his many visits to Ottawa, and having heard so much about the winery and tasted all the past vintages, I was really taken aback when I arrived at the winery. I know John has spent a small fortune on Painted Rock after having retired from a very successful career as a stock broker, but this is not obvious from the winery itself. The winery is new, simple, clean, highly functional and slightly hidden in the hillside of the vineyard. It's large enough to house all the tanks and barrels and that is all they need. The tasting room has been referred to in the Globe and Mail as a "tiny tasting room that stands alone on a slope like a misplaced tool shed", but that is all that is required for now. And I think all this is what I like most about the Painted Rock and their vision: unlike many people who erect massive ostentatious tasting rooms and showpiece wineries first then focus on the grapes second, John has such an aggressive mandate for quality that everything has went into his remarkable vineyard first. And when you see it, its breathtaking. To get a better understanding of this check out their archive of aerial shots from past decades. I also took this slightly shaky Blackberry video to try and capture the dynamic setting while touring the vineyard on a fourwheeler. Their wine is about what is most suited to the site, and that vineyard has proven to do a world class job of ripening Bordeaux varietals, especially the more difficult Malbec and Petit Verdot. An important part of their philosophy is thinking outside of the box, not just following conventional truisms. So upon the advice of Alain Sutre, their consulting oenologist from Petrus in Bordeaux, Painted Rock began using Malbec and Petit Verdot as larger components to better express the vineyard in their proprietary blend instead using them as smaller percentage ingredients as is de rigueur in traditional Bordeaux blends. With 15-20% Petit Verdot and Malbec in the Red Icon, instead of 1-5% as is customary in Bordeaux, Painted Rock showcases what it does best. Although inspired by Bordeaux varietals and techniques, this way it becomes a truly "Okanagan wine", not just a carbon copy of Bordeaux. Similarly their Chardonnay undergoes a three stage harvest, picking part of the crop early, blending the more acidic juice with the later picked riper juice to introduce a naturally made complexity and balance that many wineries in warmer regions achieve only by adding tartaric acid to the wine. It's the combination of an incredible vineyard and winemaking details like these that support the accolades and contribute to making Painted Rock one of Canada's very best wineries. This just looked like: "Painted Rock Wines - Built Ford Tough"
Composting stems and musts never looked so epic. Skaha Bluffs provincial park surrounds the vineyard, protecting it from expansion or outside development. 400 year old Native pictographs back in the Bluffs. This inspired the name Painted Rock and Red Icon. The view down over the vineyard from atop the bluffs. You can see Penticton and Lake Okanagan in the distance to the north. The evening lights of Penticton shining over the Bluffs at the winery. For their wines in Ontario please contact Lifford Wine & Spirits, and for their wines outside of Ontario please visit their online store.